Gift certificates make great contest prizes and promotional gifts and can also be used as a customer loyalty campaign tool. 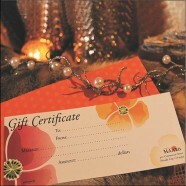 We provide sequential numbering options which help you keep track of all the gift certificates you sell or give out. If required, we can also supply blank envelopes with the certificates to use for presenting to your clients or promo winners. Our gift certificates are printed on digital presses with a standard turnout time of about 1 – 2 business days. However we can also have your certificates printed instantly at an additional cost. You can place an order for as low as 10 gift certificates or for as high as 2,000 gift certificates which we will deliver to you on a glossy/matte card stock. We make sure your design’s colours stand out vibrant with a classic finishing. The paper we use comes from sustainable sources where ballpoint pens, permanent markers and oil-based ink pens work best on. Our certificates however need some scoring before folding it.